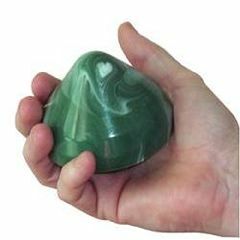 AllegroMedical.com presents The Thumbby Soft Massage Cone. Thumbby™ Soft Massage Cone. Provides a deep massage without wearing out your thumbs. The Thumbby™ massager is made of solid silicone, the same material used for many household and personal items. Silicone is non-reactive, meaning it can be used with most massage lotions and oils. Massage Therapists (MTs) can work more hours a day and have longer careers because the Thumbby™ Soft Massage Cone saves wear and tear on the hands. The Thumbby™ massage cone is like an extension of the hand! The point is like a thumb. The side is like the ulnar side of the palm. The bevel is like the heel of the hand and the base is the size of the palm. The Thumbby™ massage tool is very comfortable on the receiving end, whether used for self-care or massaging someone else. The base has enough suction to stick the Thumbby™ massager onto a smooth surface. For personal use stick the Thumbby™ Soft Massage Cone to a wall or door-frame and self-massage your own back or Stick it to the floor and give yourself a fantastic foot massage! The Thumbby™ Soft Massage Cone is light in weight. At only 5.5 oz., it's totally portable. Any time you practice a physical activity, take along a Thumbby™ Soft Massage Cone to help loosen up your muscles beforehand and afterwards.